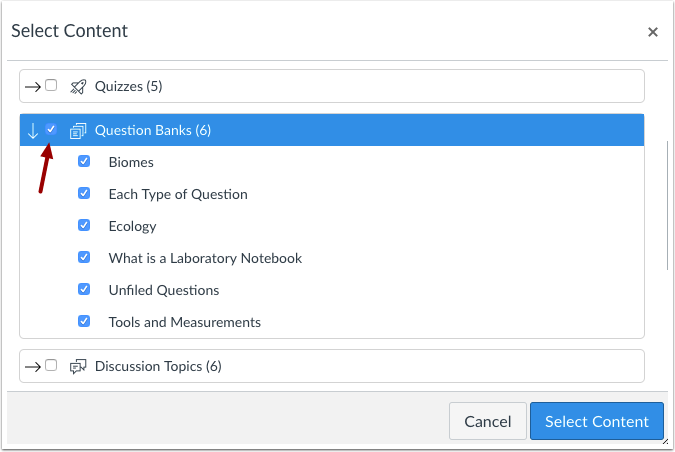 You can easily share Question Bank questions among several Canvas courses. 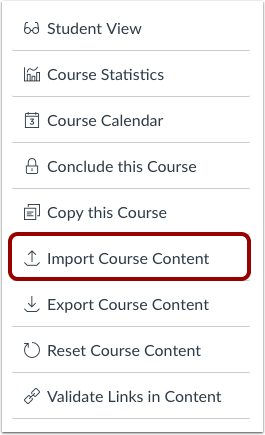 Click the Import Content into this Course button. In the Content Type drop-down menu, select the Copy a Canvas Course option. 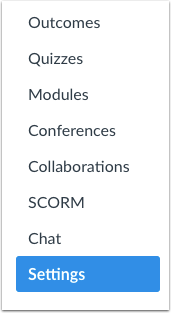 In the Search for a course drop-down menu , select the course you would like to access. You can also choose to include completed courses by selecting the completed courses checkbox . You can also search by course name in the Course Name field . Start to type the name of the course you would like to access. Click the name of the course when it appears. In the Content section, click the Select specific content radio button. In the Current Jobs section, click the Select Content button. Locate the Question Banks group. Most groups will have more than one question bank. To view the Question Banks, click the group's expand icon. To import all question groups, click the checkbox next to the group name. Canvas automatically selects all items within the group. Note: To import only a few question banks, select the specific items to be imported. Canvas will place a dash in the Question Groups checkbox, indicating not all items are selected within the group. Click the Select Content button. The Current Jobs section displays the status of your import. Running reports display a menu bar with the time remaining to complete the import. The import may also display errors as part of the import status. Learn more about course import statuses. When the course has completed, view your question banks by accessing the Quizzes link in Course Navigation. Previous Topic:How do I reorder questions or question groups in a quiz? Next Topic:How can I create a quiz where students only see one question at a time? 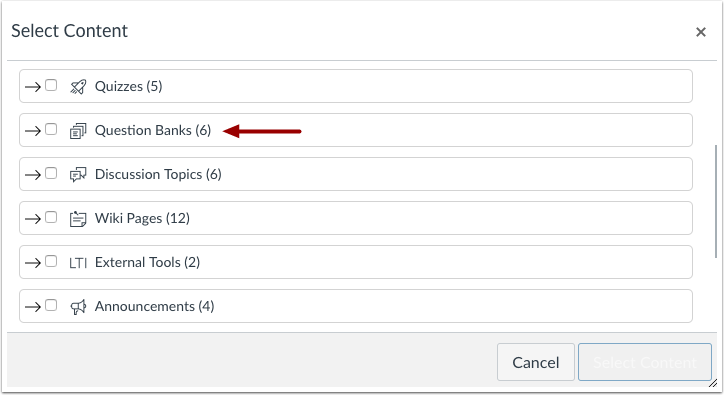 Table of Contents > Quizzes > How do I import a question bank from one Canvas course to another?